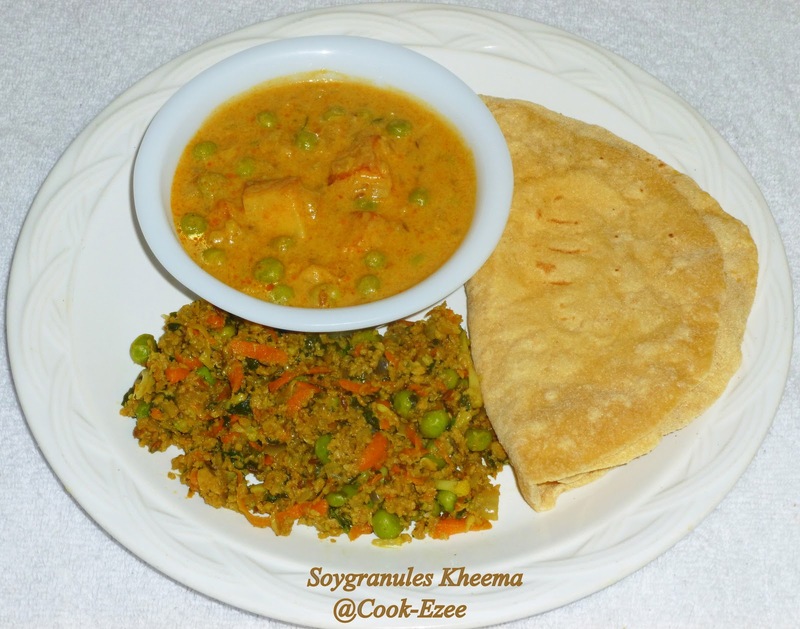 Soybean chunks and soy granules were not in my favorite list till I discovered some of the masala versions of it. I remember the taste of Soy chunks in veg-biriyani which we used to have in our childhood, it resembled a lot like mutton/goat. I tried making soybean biriyani once but it didn't turn out that great as I expected and I was a bit disappointed. On a Friday evening we had a guest and I made soy granules cutlet to be served with tea since it was ezee to prepare just the way it was mentioned in the Nutrela pack. We were enjoying the hot masala tea with cutlet on that cold winter eve and I was talking to this friend of mine. As usual we had many topics to discuss and finally I told her about my soy biriyani experience. She was from Mumbai and she told me the kind of soy recipes her mom use to make especially with the soy granules, veggies and garam masala powder where no body could really figure out it was soy granules. That idea of soya cooking striked my mind and I thought of giving it a try. I named it Soya Kheema because it looks like mutton/chicken kheema when prepared. We really started admiring the taste of Soybean from then. Thanks a lot to my dear friend Shifali for suggesting me an awesome soya cooking. 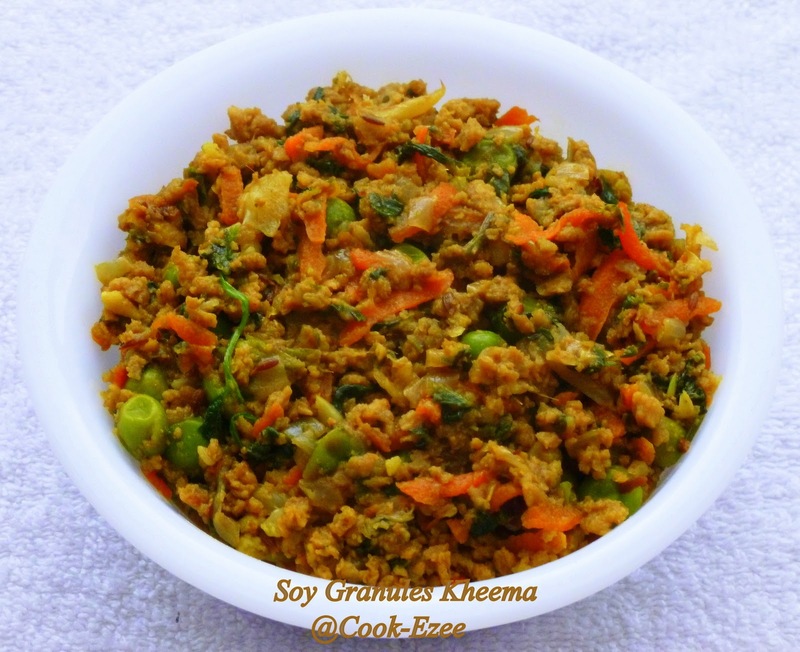 So here comes my recipe of Soya Granules- Veggies Kheema. Heat up a kadai/frying pan, pour oil, add Cumin/Jeera and stir for a minute till they crackle. Add minced ginger-garlic and saute for a minute, add green chilly, few curry leaves, onion, salt and saute well till onion turns translucent. Add all the masala and stir for a while in medium heat. Add in veggies, 2 tbsp coriander leaves and saute till veggies get mixed well with masalas. Close the pan with a lid and let cook for five minutes in low-med heat till veggies is almost cooked. Add soya granules at the end(soya will be already cooked when you put it in boiled water) and stir it well to mix with masalas and veggies. Cook it covered for another five minutes so that masala is evenly spread over soy granules and veggies. Switch off the stove. Garnish with rest of the chopped coriander leaves and serve it hot with Roti/Naan/Rice..
Nutritional Info:- Soya beans is a good nutritional food for kids and adults. It contains more proteins than milk, egg, wheat and meat. It is low fat, low cholesterol and high protein food. It is a good alternative for mutton/chicken and red meat. I like this dish. I'll try to make this. May be a dumb question.But from where can I get soya granules? May be a dumb question.But where can I get this soya?